The failure of Congress to pass new budgets for the current fiscal year has produced a crisis in science financing that threatens to close major facilities, delay new projects and leave thousands of government scientists out of work, federal and private officials say. Last year, Congress passed just 2 of 11 spending bills — for the military and domestic security — and froze all other federal spending at 2006 levels. Factoring in inflation, the budgets translate into reductions of about 3 percent to 4 percent for most fields of science and engineering. Congressional Democrats said last month that they would not try to finish multiple spending bills left hanging by the departed Republican majority and would instead keep most government agencies operating under their current budgets until next fall. Except for the Pentagon and the Department of Homeland Security, the government is being financed under a stopgap resolution. It expires Feb. 15, and Democrats said they planned to extend a similar resolution through Sept. 30. Some Republicans favored not finishing the bills because of automatic savings achieved by forgoing expected spending increases. Democrats and Republicans alike say that operating under current budgets, in some cases with less money, can strap federal agencies and lead to major disruptions in service. Scientists say that is especially true for the physical sciences, which include physics, chemistry and astronomy. When it comes to federal financing, such fields in recent years have fared poorly compared with biology. The National Institutes of Health, for instance, spend more than $28 billion annually on biomedical programs, five times more than all federal spending for physical sciences. For 2007, Congress and the Bush administration agreed that the federal budget for the physical sciences should get a major increase. A year ago, in his American Competitiveness Initiative, President Bush called for doubling the money for science over a decade. That prompted schools and federal laboratories to prepare for long-deferred repairs and expansions, plans that appear now to be in jeopardy. Among the projects at risk is the Relativistic Heavy Ion Collider at the Brookhaven National Laboratory in New York, on Long Island. The $600 million machine — 2.4 miles in circumference — slams together subatomic particles to recreate conditions at the beginning of time, some 14 billion years ago, so scientists can study the Big Bang theory. It was already operating partly on charitable contributions, officials say, and now could shut down entirely, throwing its 1,069 specialists into limbo. “For us, it’s quite serious,” said Sam Aronson, the Brookhaven director. For the nation, Dr. Aronson added, the timing is especially bad because the collider has given the United States a head start on European rivals, who hope to build a more powerful machine. Another potential victim is the Fermi National Accelerator Laboratory in Illinois, where a four-mile-long collider investigates the building blocks of matter. Its director, Piermaria Oddone, said the laboratory would close for a month as most of the staff of 4,200 are sent home. Congress and the Bush administration could restore much of the science financing in the 2008 budget. Scientists say it would help enormously, but add that senior staff members by that point may have already abandoned major projects for other jobs that were more stable. A $1.4 billion particle accelerator at the Oak Ridge National Laboratory in Tennessee meant to probe the fine structure of materials and aid in cutting-edge technologies. Its opening might be delayed a year. A $30 million contribution to a global team designing an experimental reactor to fuse atoms rather than break them apart. Controlled fusion, if successful, would offer a nearly inexhaustible source of energy. A $440 million X-ray machine some two miles long at the Stanford Linear Accelerator Center in California that would act like a microscope to peer inside materials, aiding science and industry. Construction, begun last year, would slow. The National Science Foundation, which supports basic research at universities, had expected a $400 million increase over the $5.7 billion budget it received in 2006. Now, the freeze is prompting program cuts, delays and slowdowns. 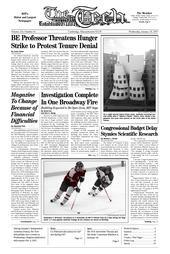 The threatened programs include a $50 million plan to build a supercomputer that universities would use to push back frontiers in science and engineering; a $310 million observatory meant to study the ocean environment from the seabed to the surface; a $62 million contribution to a global program of polar research involving 10 other nations; and a $98 million ship to explore the Arctic, including the thinning of its sheath of floating sea ice. Missions at the National Aeronautics and Space Administration are also threatened, with $100 million in cuts. Paul Hertz, the chief scientist at NASA’s science mission directorate, said potential victims included programs to explore Mars, astrophysics and space weather. Physicists said a partial solution to the crisis would let the Energy Department do what it wanted to do all along for 2007: move $500 million left over from environmental cleanup accounts into the physical sciences. That would require Congressional approval but no budget increase.